ALS Care offers services to patients, families, caregivers,support groups,insurance providers, long term care facilities, medical professionals or other organizations in need of information and resources to manage ALS patient issues. Phone Care Calls : Patients, families, and in-home caregivers can rely on Mary Beth as a specialist available to them by telephone appointment. Get answers to questions and concerns, information and guidance about insurance, expectations about care needs, or any other ALS home care related issue. A typical telephone consultation may be 1-2 hours, and can be a great asset to managing immediate care needs, as well as planning for future needs. 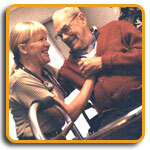 In-home Visits: ALS home care requires detailed coordination of all the members of your home care 'team'. Whether it is time for a feeding tube (PEG), or a demonstration on the proper use of your adaptive equipment such as a Hoyer lift, Mary Beth can show you how. Respiratory issues can be managed at home with caregivers either hired or volunteered when trained correctly with your Bi Pap, Cough-Assist or Suction machine. Prior to discharge from the hospital, newly ventilated patients with a tracheotomy will need a plan of care. Mary Beth will arrange, assemble, and organize the equipment, as well as, train your team of caregivers. What may seem like an overwhelming undertaking can be greatly simplified when placed in her competent hands. Mary Beth will work with your family, your physician, your insurance company and your care team to make living with ALS possible out of the hospital and in your own home. Letter of Medical Necessity : Such a letter is often the critical element in obtaining the necessary funding/coverage for ALS patient equipment and caregiver services. A skillfully drafted letter of medical necessity is essential to obtaining assistive technology. Whether the letter is being submitted to the Department of Human Services, a private insurance company, or other funding source, ALS Care knows the proven formats and information needed to convince the reader that the requested assistive technology is a bona fide necessity. Mary Beth will also work with your doctor to obtain the physician endorsement and/or prescription that needs to accompany your letter. Teleconference for Support Groups : Are you a support group in need of a qualified speaker but with a limited budget for travel? Mary Beth has developed a dynamic Teleconference System that is very cost effective and educational. Mary Beth will create a PowerPoint presentation focusing on the issues the group wishes to address - nutrition, mobility, communication, exercise, symptom management and many others. The patient's challenges are addressed in a presentation that can be shown group-wide while Mary Beth takes you through the presentation via teleconference. She will interact with members of the group and answer questions while offering support and guidance. The entire presentation will be available on CD-Rom. It will be a library to share with patients that are not available to attend the support group. Event Speaker : Mary Beth is an informative speaker for support groups, seminars or other gatherings of medical professionals or advocacy groups. Whether your event is a small roundtable, or a large symposium, Mary Beth is a lively speaker who can effectively demonstrate and deliver useful information to your attendees. Telephone and On-site Consultations: Just as Mary Beth can provide consultations to individual patients for their needs, she can also work with physicians, home health agencies, nursing homes, discharge planners, insurance providers, etc to help you design effective programs, policies and protocols for the ALS patients you serve.